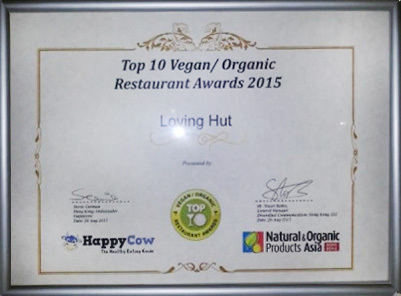 Wednesday 26 August witnessed the 2015 Hong Kong Top 10 Vegan/Organic Restaurant Awards presented by Happycow.com. Part of Natural and Organic Products Asia 2015 at the cavernous Hong Kong Conference and Exhibition Centre, the ceremony was also supported by Meat Free Hong Kong. *Grassroots Pantry – Boutique cafe serving wholesome, world-inspired dishes. Approx 90% of the menu is vegan suitable. Sources unprocessed local, sustainable and organic ingredients. Having (organically) outgrown their premises in Sai Ying Pun, they are super busy this week before formally opening on 1st September at a bigger/better/stronger/faster location on Hollywood Road. *Light Radiant Food – All vegan, and also popular with organic zealots. A great example that among the best you don’t have to be anywhere near the biggest. Eclectic food individually prepared by the owner who always gives service with a friendly and easy smile. There’s almost a hint of quirkiness in this place to add to the charm. With management soon taking a break, be quick; On September 5th they bring down the shutters for the last time at Eastern Street in Western District. Keep your eyes open in the future for them at new premises. *Lock Cha Tea House – All vegan dim sum in beautiful settings in Hong Kong Park. No surprise it’s also frequented by tea connoisseurs. *Loving Hut – There’s a branch on either side of Hong Kong Harbour of the worldwide Loving Hut restaurant franchise, both very popular and very successful. All vegan and priced for mass market appeal, the customers keep pouring back. *Mana! – Partly managed by Bobsy, pioneer of so many contributions to the compassionate eating scene in HK. Now with their 3rd branch opened in August to take them to the trendy Poho area of HK Island. Unsurpassed on policies of eco-friendly packaging, recycling and food waste management. Mostly vegan westernised food popular with organic food hunters. *Popular Vegetarian – One of many vegetarian Chinese restaurants in HK popular (there’s a clue in the name) with its neighborhood community, but distinguished from most by its all-vegan food policy. Their pricing fits most budgets. Easily found on Des Voeux Road West. On the 6th of every month they give free food to the elderly. *Pure Veggie House – A big restaurant with some serious backing behind it. All vegan with an extensive Chinese food menu from their own organic farm. They are just up the hill on Hong Kong Island from the tourist throngs at the nearby Peak Tram. *Thai Vegetarian Food – No points for guessing what they offer in this establishment in Kowloon City. All vegan and with the ethnicity of the cuisine giving it a flavour-filled differentiation from any of the other all vegetarian eateries in HK. Affordable pricing has this place packed every time it opens. Another success story for very small enterprises. The healthy eating scene in Hong Kong is undoubtedly blossoming. HK compares credibly with the best in the world, for example on the number of all vegetarian eateries on offer. Take a look in the HappyCow listings and see how many cities seem to shape up better – not many do. It’s not just the restaurants above bringing vegan/organic food developments to HK. Many other places here didn’t make the top 10. Interesting times lie ahead in the HK progressing to another level.